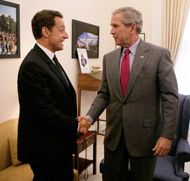 Spoof news: Incredible Shrinking Sarkozy! "How's it going down there?" French scientists are deseperately seeking a way to stop the president, Nicolas Sarkozy, shrinking. It is feared that if they do not succeed he will be invisible to the naked eye by Christmas. Unfortunately for the President, no-one noticed his condition until recently because whenever he was seen in the company of his glamorous wife, singer Carla Bruni, she wore flat heels. But an awkward moment at a recent meeting of EU heads brought his height to the notice of advisers. "It was after German Chancellor Andrea Merkel greeted him with 'How's it going, short-arse?' that we began to look closely," said a French government insider. "There has been noticeable shrinkage." The only previous example of the condition scientists have to study is the case of Scott Carey in the 1957 movie The Incredible Shrinking Man. Dr Jean-Claude De Rigeur of the Sorbonne Bizarre, Weird and Odd Medicine Faculty said: "Oui, nous avons seen cette movie et nous avons un clue. M Sarkozy 'as certainly visited un nuclear power station recently, et Mme Sarkozy told us she playfully sprayed 'im with insecticide dans les jardins of ze Elysee Palace! "Nous believe zat comme Scott Carey, le President 'as been affected by zis mixture. "We 'ave a team of les top medical scientists Francaises working, er, 'ow you say, round ze clock to find a way to reverse ze condition. "I am certain we shall 'ave M Sarkozy back to 'is old self very soon. We cannot 'ave 'im 'aving to look up to ze uzzer world leaders, can we?"